“Environmental sustainability is part of our DNA,” Canon U.S.A. Senior Director Amy Newman says of her company’s longstanding commitment to considered design for everything from its world-famous products, which are built with environmental impact in mind, to its new headquarters in Melville, Long Island. Since the Tokyo-based company opened its U.S. subsidiary in New York City in 1955, Canon U.S.A. has produced sustainably minded, cutting-edge technology. For instance, over the past 25 years, Canon has maintained a program to turn old toner cartridges into pellets that make up recycled products. Over the years, the company has won accolades from the U.S. Environmental Protection Agency (EPA) for its contribution to reducing greenhouse emissions through its manufacturing methods, and many of its products have been ENERGY STAR® certified — an EPA designation given to environmentally sound products. Today, the Canon Americas headquarters located in New York is also expanding into pioneering research and development with subsidiaries such as Canon BioMedical and Canon U.S. Life Sciences. “When we moved we really wanted to stay on Long Island because our workforce is here,” Newman says of her company’s commitment to the region, its home since 1971. One Canon Park opened in Melville in 2013, and is one of Canon’s three regional headquarters. At 700,000 square feet, Melville is home to nearly 1,600 employees — employees that have been contributing to Canon’s success for more than 60 years. Canon has long provided some of the best in camera and technology equipment. Many of their products have harnessed the seminal technical advances of the 20th century, including the 1960 Canonflex, which featured the groundbreaking single-lens reflex (SLR) camera — a mirror and a prism that create an exact replica of what will be photographed. Later, Canon released DSLR models, transferring that precision into the digital realm. Over the past several years, Canon has also made major inroads into areas like biomedical research as a part of the focus on trying to make Long Island a strong biomedical corridor, Newman explains. Established in 2015 as the first Canon business to be headquartered outside of Japan, Canon BioMedical operates with a startup model, and has produced major advances in areas like genotyping and pharmacogenetics. That research helps doctors obtain critical genetic information for carriers of Tay-Sachs and other genetic diseases. Additionally, Canon BioMedical’s advances in genotyping are used to help researchers tailor medication for individuals who can’t process important pain medicines like codeine. As camera technology has shifted to digital and phone cameras, Canon has kept apace. It now produces photo prints, full-frame digital SLRs, freestanding digital X-ray detectors, and security cameras. Canon today is poised to tackle the future of the camera and digital world, harnessing its robust history to build products for the new tech and visual economy. Canon has been New York-based since the 1950s, and expanded eastward to Long Island in the 1970s. For its most recent expansion, Canon looked toward an area that would enable significant innovation so that it could ensure the new site “was built for the future,” and the kind of longevity the company sees for itself in New York State. It’s also a fantastic time to be on Long Island, whose Regional Economic Development Council has received $425 million from the state for 470 initiatives. New York State has been integral to Canon’s Melville campus — it helped clear the way for development, Newman explains. “Moving to Melville sort of opened up untouched talent because Lake Success was too far for those who live further out east. We’re also able to attract out-of-state candidates who might not want to relocate to Manhattan,” Newman underscores. Canon’s HR team has also joined forces with Long Island universities to recruit the newest talent. For example, it’s become a Red Hot Diversity Champion at Stony Brook University — a program that seeks to promote diversity in its corporate recruiting. In addition, Newman says, the company was recently invited by Farmingdale State College to join that school’s employer advisory board; it also recruits from Adelphi University. “There’s this reciprocal relationship,” Newman explains. One that extends outside of the immediate region to schools including Pace University in Manhattan, Queens College, and Rochester Institute of Technology (RIT), she says. Those schools feed into the robust workforce that’s a part of Canon today. The Melville site is also designed with the long view for Canon’s employees in mind. “We want our employees to feel as comfortable as possible while they’re at work,” Newman says. One Canon Park features a gym, and walking trails in the front and back of the property. It also has a 12,600-square-foot showroom of Canon products designed for the whole community, including schools, visitors, and professional groups looking to understand Canon’s product portfolio and history. “Environmental sustainability is important in everything we do, so it really wasn’t shocking that this would hold true for our facility,” Newman explains of her company’s deeply ingrained philosophy surrounding sustainable design. That approach governs everything from its ENERGY STAR® products and carbon emissions, to the Melville campus itself. “We are the largest commercial LEED Gold certified building on Long Island,” Newman says, citing a company culture built to support the environment and communities in which we live. In addition, Canon supports several charities, and its interest in public service comes “from the top down.” That service includes support for organizations like the American Cancer Society: “That’s part of our fabric,” Newman explains. The company sometimes facilitates exchanges between employees in the U.S. and overseas, underscoring the international nature of the business. 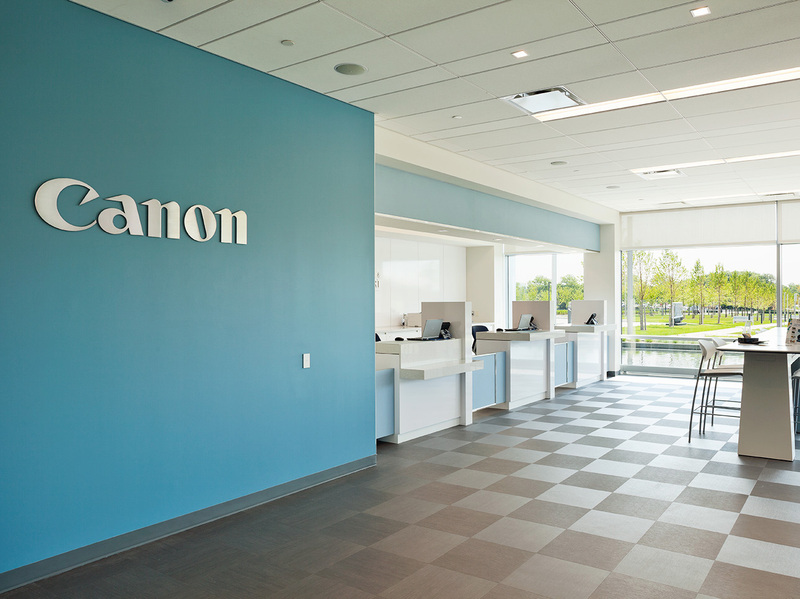 As Canon moves further into the 21st century with medical research and innovative camera technologies, Newman is excited about its decades-long commitment to Long Island — her longtime home. She thinks the quality of life Canon looks to in Melville suggests not simply longevity, but also dedication. “We stayed in the region, we retained jobs, and we’ve been creating jobs as well,” she says — all while continuing to enable everything from movie making to personal photography to genetic mapping: a snapshot into the future. For more information on the optics and imaging industry in New York State, contact RJ Ball at Optics@esd.ny.gov or (716) 846-8200.